Purcahse a wide variety of Fender Musical Instruments through Amazon including amplifers, guitars, strings, and other products. This amplifier is designed for rock, blues, and country guitar styles but it will worth for other styles too. The amp features 22 Watts of power to get those famous clean Fender amplifier tones. Many famous recordings were made by the original release of this amplifier. The amp has dual 6V6 Groove Tubes, one 5AR4 rectifier tube, and 4 12AX7 preamp tubes, along with two 12AT7 tubes which make this a stunning all tube amplifier. There’s a Jensen C-12K speaker and two channels on the amplifier. The channels are normal and vibrato. The amplifier also has the famous Fender reverb and comes with a two button footswitch for reverb and vibrato on-off. The grill is in silver and the amplifier features black textured vinyl covering. The controls knobs for the normal channel include volume, treble, and bass. The vibrato channel has volume, treble, bass, and reverb. The vibrato channel also features speed and intensity knobs. Will I Enjoy This Amplifier? This amplifier has some limitations and it’s not for everyone. 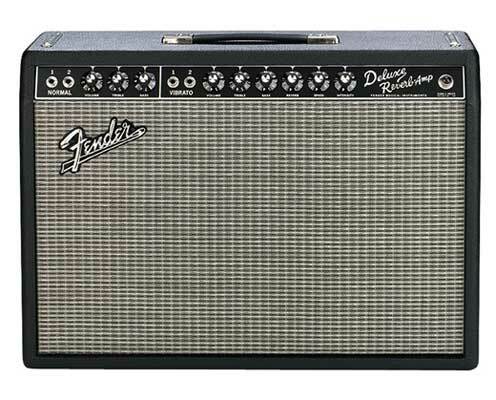 For those that like to play blues, country and basic rock this Fender 65 Deluxe can’t be beat for the clean tones it provides. The main problem with Fender amplifiers is that if you want aggressive distortion you’ll need to buy additional pedals to get those types of sounds. This amp has no distortion channel but it will distort to some degree as you turn it up due to the tube style natural distortion. If you watch the video you can see exactly what this amplifier can do. It can cover most styles and provide you with amazing tones but it won’t cover aggressive metal styles or shred which these amplifiers are not designed to do. When you crank it up the amplifier will provide you with some nice rock tones but nothing on the heavy distortion side. The reverb on Fender amplifiers such as this one is some of the best reverb you will ever hear which makes this amplifier even better. This amp will cover most rock and roll styles at higher volumes and will sound even better with a good distortion pedal such as those by Boss. if you want more power out of a Fender look at the Frontman 100 Watt by Fender. Should I Buy This Fender Amplifer? I can recommend this amplifier if you want to create natural guitar tones with tube style distortion. This amplifier is really versatile and it will provide you with a great deal of tones to enjoy. The amplifier won’t appeal to metal players due to the fact that it can’t produce aggressive style distortions like Marshall or other amplifiers which are designed for harder rock. You can get those tones out of it however with some good pedals. Adding a pedal such as a wah-wah to this amplifier would make it sound amazing. View the video and judge for yourself the types of tones this amplifier can produce. Just remember that it's all tube so you'll need to replace the tubes when they burn out but you should get plenty of use out of the amplifier before the tube go out on the unit. It might be a good idea to grab some spares so they are handy in an emergency when you need the amplifier up and running quickly. It will cost you just over $800.00 but its well worth that price tag. The Fender 65 Deluxe Reverb Reissue is a winner in my book.